Diagnosis: The process of identifying or determining the nature and cause of a disease or injury through examination and evaluation of patient history. Regular cleanings at periodic intervals. Teeth cleaning (also known as prophylaxis,)is a procedure for the removal of tartar (mineralized plaque) that may develop even with careful brushing and flossing, especially in areas that are difficult to reach in routine tooth brushing. Professional cleaning includes tooth scaling and tooth polishing and debridement if too much tartar has accumulated. This involves the use of various instruments or devices to loosen and remove deposits from the teeth. Fluoride dental treatment is a very effective way of helping to prevent tooth decay. It is a mineral that is found naturally in food and water supplies, and the benefits are well known as it was originally added to the public water supply 60 years ago in carefully controlled amounts. A dental sealant is a thin plastic film painted on the chewing surfaces of teeth to prevent cavities. Dental radiographs, commonly referred to as X-ray films, or informally, X-rays, are pictures of the teeth, bones, and surrounding soft tissues. 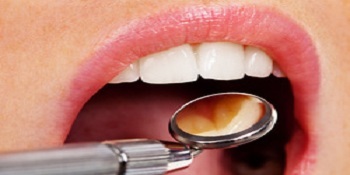 As part of your routine dental exam, your dentist will conduct an oral cancer screening exam. More specifically, your dentist will feel for any lumps or irregular tissue changes in your neck, head, face, and oral cavity. When examining your mouth, your dentist will look for any sores or discolored tissue.